Older Adults Technology Services, a New York City nonprofit that provides free technology training classes to seniors, faced an operational budget shortfall. Older Adults Technology Services is a New York City nonprofit that provides free technology training classes to seniors. The company used federal stimulus funding to help build the Senior Planet Exploration Center, a tech-themed community center that opened for classes in January 2013. The center would face an operational budget shortfall of more than $400,000 when federal funding zeroed out in October 2013 and needed increased funding from New York and corporate sponsors. "We never had a PR agency before," says Tom Kamber, executive director and founder of the company. "The technology network we built for Senior Planet was very newsworthy, but we needed to fund it after October. We hired Spector & Associates for as much as we could afford to help us raise awareness of the center." The agency used media relations to drive greater awareness of the importance of technology access for older adults, highlighted ways in which Senior Planet met that need, and positioned the program as a national model. "Tom and the organization had a solid reputation so we leveraged the thought-leadership platform that was already in place and used the center as a manifestation of that," says Elliott Suthers, VP at Spector & Associates. A launch and a sponsor event, as well as a rally, drove awareness. Local trade, business, and political outlets were given tours of the center before and after a March 7 ribbon-cutting ceremony. Media and sponsors - AARP, Verizon, AT&T, and Time Warner Cable - also attended the event. A panel discussion with experts in aging from the AARP Foundation and the City of New York followed the ceremony. The discussion was streamed live on seniorplanet.org and the team tweeted discussion points. AT&T sponsored a Job Searching in the Digital Age class, and the firm worked with AT&T's communications team to plan and promote a March graduation event. 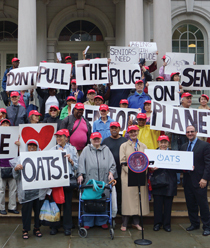 A June 14 rally was held on the steps of City Hall in New York with about 200 local seniors and city council supporters to pressure the Bloomberg administration for funding. "We timed the rally to coincide with a meeting between Mayor Bloomberg and Lilliam Barrios-Paoli, commissioner of New York City's Department for the Aging," Kamber adds. Additional tactics included a digital petition and a signed open letter of support. The New York City Council provided $280,000 for Senior Planet immediately after the rally and created a $738,000 annualized general fund allocation for the center in December. "We never received money from the general fund before," Kamber notes. "Our sponsors also increased their funding and levels of involvement." The story garnered coverage in outlets such as Today, CNBC, Fox News, The New York Times, and The Washington Post. "Seniors who saw media coverage flooded in after the March 7 launch," Kamber adds. More than 20,000 seniors took classes in 2013 - 200% above the annual enrollment goal. "There were 250 people lined up outside on the morning of October 1 when we opened the doors for fall semester enrollment," Kamber says. "All semester classes for that season were full within two hours." Given the campaign's success, the board of directors approved the hire of Spector & Associates on a one-year contract basis. Plans include continuing to draw national attention to Kamber as a thought leader and support- ing corporate sponsor programs. This campaign illustrates PR's ability to drive tangible results on so many fronts. The center clearly benefited, as did sponsors and seniors. Concurrently, this team did an outstanding job of driving the Senior Planet concept on a national level, which will undoubtedly begin to benefit more seniors and more cities and communities throughout the US. Given the mission of the organization, Kamber's vision, and the agency's continued involvement, the sky would seem to be the limit on what can be accomplished going forward.